Bob National is undergoing some major changes part of this was to move to a new datacenter and version over the summer 2016, which has had an impact on clips and multipart clips previously held on Bob. Currently multipart clips are not offerederd by the new version of Bob National and therefore any multiclips previously made have now been lost. However due to substantial feedback from users they have announced that they will be developing a new multipart clip function some time in the future. As for regular clips they should now transferred over to the new version of Bob. 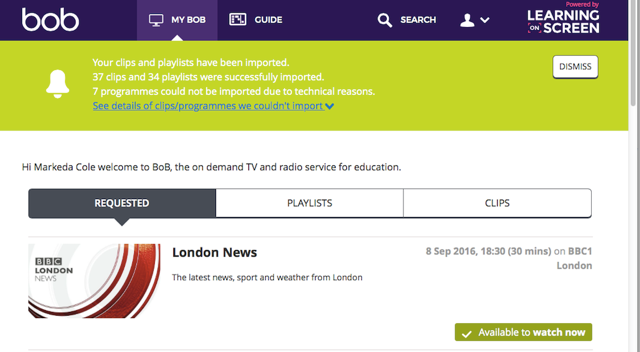 When signed in to BoB National, you should see the following orange banner prompting you to import playlists and clips saved under the email address registered previously (please ensure you’re using the same email address as in the old system if you want to import your old clips and playlists). If you select ‘yes’, clips and playlists will be imported straight away, if you choose ‘no’, you won’t see the prompt again. You’ll then be presented with a green banner reporting on the import of your playlists. Expand the link to see if any programmes were not imported successfully. This is for your information but can’t be recalled. If there are any errors it’s probably because of a problem with the original file. If so, please take a screenshot or save for offline viewing if you need an item in the list. If you do not see the first banner as expected, please make sure that you have entered and verified the correct email address; this should be the same email address used in the last version of Bob National. If you are using the correct email address please clear out the cache and cookies in your web browser, failing that please try and alternative web browser. If there is still and issue then please contact serviceline. You only need to log in once per session. If there are multiple videos you can either click “Try again” on the video or refresh the page. How do I record a TV programme? These programmes have already been requested and processed by someone else. The link supplied is immediately available to view. These programmes have already been requested, but are not yet processed. The link supplied will be viewable in a couple of hours. 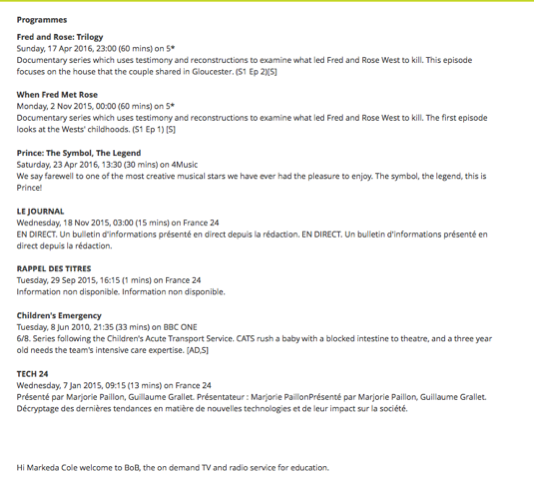 These programmes have already been requested, but have not yet been broadcast on TV. The link supplied will be viewable a couple of hours after the end of the programme. These programmes can be requested by you. Click on the programme and then click “Request Programme”. Start typing “Southampton” in the filter box and select “University of Southampton” from the list. The first time you use the site you will be asked to enter your email address and to accept the terms of the site. You will not be asked to do this step again. You may now browse the site and request up to five recordings per day.